At £1099, the Xa is the most affordable keyboard in the Fantom range. But inevitably, features have been removed to make it such a bargain. Have Roland thrown out the works from the workstation? 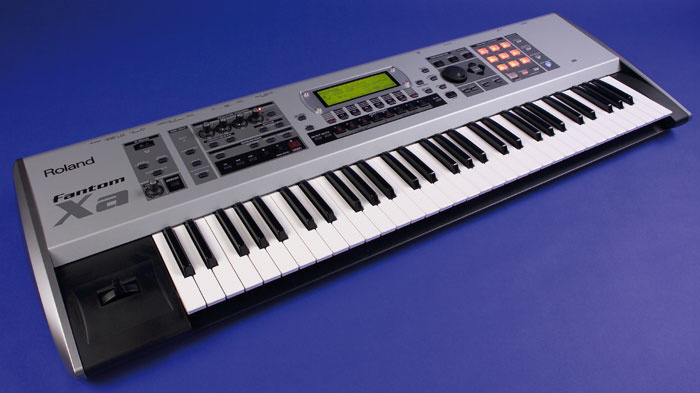 The Fantom Xa is the eighth model to appear in Roland's Fantom range of workstations and is, with the exception of the Fantom XR rack module, also the cheapest. To achieve this, many of the facilities found on the other Fantoms have been removed. In principle, this makes it immediately attractive, but in some ways it's clearly less powerful than its forebears. Most obviously, the 320x240-pixel colour screen of the X-series has gone, to be replaced by a 240x64-pixel greyscale screen. Ironically, given that this is the first Fantom keyboard to sport a small LCD, the soft-keys and the on-screen commands now line up perfectly. There's even a bit of panel artwork to ensure that you notice this (on all previous Fantoms, the buttons and commands were offset from one another). Reducing the screen resolution by 80 percent is a significant change, but, thanks to a cleverly implemented set of zoom pages for graphical displays and grid representations for programming, I was generally able to obtain the results I wanted on the Xa itself. Gone too are the likeable semi-weighted keyboards of the Fantom S, X6 and X7. Roland have removed the weights from underneath the keys, which makes the keyboard feel springy and unpleasant, and they've also removed pressure sensitivity. Peculiarly, although the keyboard can't generate aftertouch, the keyboard's real-time controllers can be assigned to do so, and the Xa will both transmit and respond to channel aftertouch. Even more peculiarly (and perhaps as a leftover trait from the full X-series workstations), the sequencer can also generate polyphonic aftertouch. This implies that the Xa will respond to poly-aftertouch generated internally or received over MIDI, but I can't find any modulation destination that responds to it. In short, Roland have made the Xa unsuitable for piano and, to a lesser extent, orchestral playing. Given that the Xa still costs over a thousand pounds, this is rather disappointing, unless you view a keyboard as a set of buttons for triggering arpeggios and patterns. But perhaps this is in keeping with some of the more Groovebox-like aspects of the Xa. For example, some of the X-series' PCMs appear to have been replaced with drum and percussion samples aimed squarely at dance music production, and then there are the illuminated pads on the right-hand side of the panel, introduced on the Fantom S. The Xa has 10 of these compared to the S- and X-series' 16, but they can still operate as drum pads, as well as triggers for other features such as Real-Time Phrase Sequences, rhythm patterns, and samples. This all seems to be... well, Groovy. In the past, I have complimented Roland on focusing products at their target markets, and in this light, the more 'dancy' sounds make sense — you just need to be aware that if you're after an orchestral or rock & roll synth, the Xa is perhaps less suitable than previous Fantoms. As far as the sound engine is concerned, the Xa retains the maximum polyphony of 128 voices and the 16-part multitimbrality of the rest of the 'X' series, but the ROM has shrunk back to the 'S' specification, with 1228 PCM waveforms rather than the full complement of 1480. Lest you think that this is a problem... it isn't. The Fantom S was and remains a phenomenally powerful synth, and I defy anybody to plumb fully the depths of the Xa's ROM, its 10 types of patch structure, its cross-modulation (FM) capabilities, the boosters, the ring modulators, the hugely flexible modulators and modulation matrix, and the many, many ways that patches can be modified with up to six (reasonably) assignable effects units. The number of programmable memories is the same as on other Xs, with 256 patch memories, 32 programmable rhythm sets and 64 Performance memories in addition to the usual bucketful of presets. But the Xa's bucket is smaller than that of the other Xs — there are 768 preset patches rather than 1024, and 36 rhythm sets rather than 40. Happily, the number of effects algorithms and the MFX architecture remain unchanged from the rest of the X series. This means that there are 78 algorithms including COSM (Composite Object Sound Modelling) and RSS (Roland Sound Space) effects. Unfortunately, it also means that Roland's aging MFX/chorus/reverb system is retained. Flexible though this is, it's dropping further and further behind the flexible Insert and Master effects structures being used on other companies' workstations, and it's time that it was replaced. Like the 'S' and 'X' series, the Xa also has a three-band compressor/limiter placed across its main outputs, which Roland call the 'Mastering Effect'. Three-band compressors like these are becoming ubiquitous on hard disk editors as well as keyboard workstations, but I think that unless they're used with great care and subtlety, they can do more harm than good — and they're certainly no match for the handiwork of a good mastering engineer. Still, you don't have to use them! Also unchanged from the Fantom S spec, the Xa offers the full complement of rhythm patterns and memories, as well as preset and user-programmable arpeggios. Nevertheless, some functions have been lost, and not just because the hardware has changed. For example, the 'Live Setting' section of the full X-series instruments is gone (which is strange, given the performance orientation of the Xa) as is the ability to use the pads to jump to favourite edit screens, and the voice monitor that showed how the polyphony was used. But when it comes to the crunch, the patch, performance, and effects structures of the Xa are all but identical to those of a full 'X', so we need say no more about them here. Apart from the loss of the user interface supported by the large screens of previous models, and the lack of the other Fantom Xs' digital inputs, sampling on the Xa appears to be largely unchanged from the 'S' and 'X' series. The means of accessing it is different (there's no Input Setting button, either), but the basis is the same. You can sample, import WAVs and AIFFs, truncate, loop, normalise, amplify sections, stretch, chop and recombine to your heart's content. I particularly like the Auto Divide function, which breaks samples up at moments of near silence and assigns the next sample number to the ensuing audio. This is an elegant way to sample sources such as drum kits, but I also find it excellent for resampling phrases played on the Xa itself. I am less enamoured of the sampling input effects; I'd rather apply effects after sampling, and thereby use the more sophisticated MFX algorithms. It's nice to see skip-back sampling here, though — once you get used to this, you'll never want to work any other way. 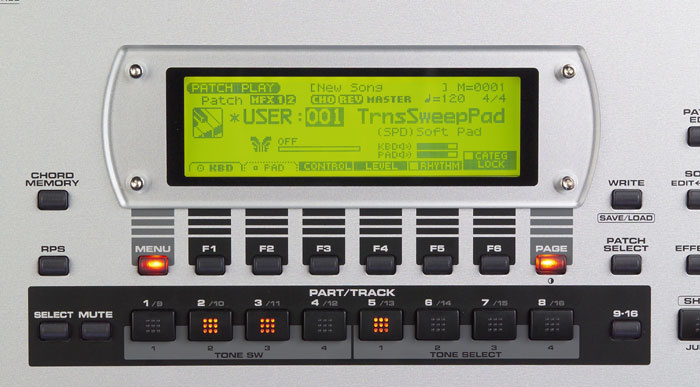 Introduced on the Fantom S and retained on the Xa, this feature simply means that the sampler is continually recording whatever you present to its input. If you like something that you hear, you can save it even though you haven't told the sampler to start sampling. The Xa's sampler lacks a couple of features that I really miss. Alt (bi-directional) looping is one; I use this extensively on my S700-series samplers. It would be simple to implement this on a processor as powerful as the one in the Xa, so why haven't Roland done it? Secondly, the Xa is still unable to import existing multisamples correctly. Overcoming this by converting and loading individual samples, re-looping and then re-allocating them to the keyboard is too long-winded for words. Just as I was finishing this article, Roland resolved this problem for the rest of the Fantom X series, but the fix does not work on the Xa. 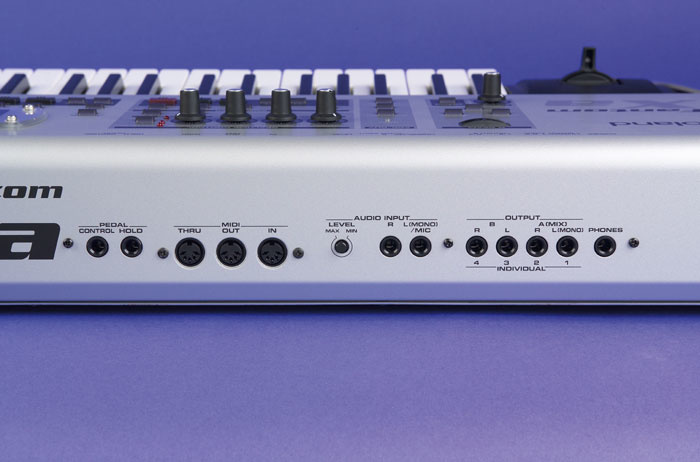 The Xa's sequencer appears to be identical to that of the other Fantom Xs, with 16 channels, each of which can hold data across all 16 MIDI channels. Song data can be directed to the internal sound engine, to external MIDI products, or to both simultaneously, and live 'mutes' allow you to inspect what's doing what to what. All the expected editing and MIDI data manipulation tools are included, but I won't list them all; if you know the way that Roland write sequencing software, you'll know what's here. Nevertheless, one facility deserves special mention; the provision of 71 templates for quantising and 'shuffling' selected data in various musical styles. That's an excellent touch. You can only edit songs in a 'temporary' area that's lost on power-down, so you have to save your work at the end of each session. Four formats are supported, these being SVQ (the format used by all of Roland's recent MRC Pro sequencers), the older standard MRC format, and Standard MIDI File (format 0 and format 1). If you save a song in SVQ format, the resulting files can include the performance/setup data as well as any associated samples. The sequencer is powerful, but I feel that this is the area that suffers most from the loss of the larger 'S' and 'X' screens. Real-time recording is a doddle, and the step-time recording and editing is well implemented given the limited amount of screen space available, but much of the operating system is text-based. This won't be a problem if you're used to working with older Roland sequencers, or other keyboard workstations, but if you have always used computer-based sequencers, and you're accustomed to large, graphical representations of controllers and other data, you may find it difficult to come to terms with the Xa's operation. If you're not comfortable using the sequencer in a linear mode, you may enjoy the provision of short sequences called 'phrases' that you allocate to pattern memories and then trigger to build tracks and songs. I'm not a fan of phrase sequencers on 'pro' instruments because the philosophy feels too similar to that of auto-accompaniment keyboards. But if you're tempted by this way of working, the Xa offers everything that you need. You can trigger and loop patterns by pressing a single note or pad, and combine up to eight of them simultaneously to create music that you couldn't play 'live' with just two hands. You can also include the patterns within longer sequences. Given the clear focus of the Xa on dance music and Roland's proven expertise in this area, it's not surprising that it excels in creating and manipulating all manner of beats and grooves. The step LFOs, arpeggiated patterns and synchronised rhythms make the Xa an instant groovebox — the Xa's sales blurb even speaks of 'instant dancefloor inspiration'. Of course, the danger with these kinds of sounds is that they can quickly become last summer's craze, unless you're prepared to delve deeper than the presets. On the other hand, the list of percussion samples, rhythm sounds and patterns listed at the back of the manual is huge, so there's plenty of scope for you to plough your own furrow. Of course, there is also a superb selection of lead sounds, pads, guitars, organs, and orchestral instruments, so the Xa is capable of acting as a first-class expander. Unfortunately, I found that layering my patches in a Performance led to a great deal of note stealing as the polyphony dropped. This is because, while the Fantom has a maximum polyphony of 128 notes, this is obtainable only if you restrict every sound to a single, monophonic PCM. If you use the full XV-engine capabilities in patch mode, the polyphony drops to just 32 notes. If you then start to layer patches, the polyphony can drop to 16, 10, eight or even fewer notes. So, while you may have 128 individual tones available, it is how you use them that will define the polyphony. Of course, this limitation is not unique to Roland's workstations and, to their credit, they explain it in the manual. Furthermore, to minimise the unpleasant side-effects of note-stealing, they have introduced an innovative note priority mode called 'Loudest'. With this selected, the quietest of the current notes is silenced, rather than the oldest, or the highest, or the lowest. This is an excellent innovation. Whichever types of sounds you use, the Xa provides a great deal of control, both over the patches themselves and the effects that you apply to them. You can assign MIDI CCs to patch parameters and effects, apply MIDI aftertouch using the knobs or a control pedal (not the same thing, I know), and assign the real-time knobs and the D-Beam to a huge variety of destinations, either directly or via a control matrix. If you're prepared to take the time and trouble, you can create some amazing textures by modulating the initial patch and effects combination. I found Solo Synth less inspiring. It's a dual-oscillator, monophonic sound generator first introduced on the Fantom S that shares its performance philosophy with that of a single-aerial Theremin. In other words, move your hand towards the D-Beam source and the pitch rises; move it away and the pitch drops. But although you can resample its output, you can't store patches, nor can you sequence them. I'm not usually a fan of polyphonic arpeggiators or auto-chord generators, either. But the chord generator can strum up, down, or up and down, and act as the note source for the arpeggiator, both of which can be synchronised with the rhythm unit. With suitable sounds, this can sound excellent, and if it's a bit too sedate for you, you can add a bit of chaos using the Solo Synth as a sort of 21st-century Theremin. I expected not to like this, but I did. When used to the full, the chord generator, arpeggiator and rhythm patterns provide miniature sequences that you can trigger, transpose and combine into complete musical backings. Neat. On the other hand, if you see a synth primarily as a keyboard instrument, the fact that the Fantom Xa offers many other performance options does not make up for the low-quality keyboard; this makes the Xa far from ideal as a conventional performance synth. This brings me to the subject of the Xa's piano sounds. The grand piano sound of the S88 is not included, but given the price point of the Xa and where it seems to be aimed, that's not surprising. However, that's no reason to make the piano sounds that are included less than overwhelming. To be fair to Roland, I am not greatly enamoured of the pianos provided by anybody's workstations, but I find the Xa's to be particularly lifeless. The best have only four velocity layers, and most of them have only two, quiet and loud. What's more, the velocity splits are obvious, with no attempt to crossfade from one to the next. If you require a realistic piano sound and action, this is not the instrument for you. If you want to delve deeper than the preset sounds and groove-style facilities, you're going to need to dig into the Xa's editing system, at which point you'll become inordinately grateful that the Xa is supplied with a computer-based editor/librarian. This cross-platform application is compatible with a wide range of platforms, from Windows 98, 2000, ME and XP to Mac OS (8.6 to 9.2.2, and 10.2 upwards). Roland recommend that PC-based users run it on a 400MHz Pentium or higher (500MHz for a Pentium III), and that Mac users should consider a 233MHz G3 the minimum spec for OS 8/9 usage, and a 500MHz G3 the minimum for running the editor under OS X. 128MB of RAM is considered the minimum for both PCs and Macs, with 256MB or higher recommended. The main patch screen from the Mac OS X Editor. The editor can communicate with the workstation via MIDI and USB, and although you have to load the appropriate driver for your PC or Mac, you'll find that this is straightforward and that, once it's done, the two devices talk to each other without difficulty. However, while you can use the USB port on the Xa to transfer samples to and from computer, and to communicate with the editor/librarian using MIDI over the USB connection, you cannot do both simultaneously. The Editor is a boon, wholly overcoming the limitations imposed by the Xa's reduced screen. Parameters are laid out clearly and — as far as is possible with such a huge sound generator — intuitively, with detailed graphics where required. Once you start to use this, everything drops into place, and XV-style synthesis is no longer daunting, it's a pleasure to use. Unfortunately, the editor only knows about Patches and Performances. The librarian part of the package handles rhythm sets, rhythm patterns, rhythm groups, chords and arpeggios in addition to Patches and Performances, but it can't edit them. This is a great shame. If the package included a sample editor, and the attached PC or Mac could manipulate and control the entire workstation, it would make the Fantom a real contender at the high end of music production. 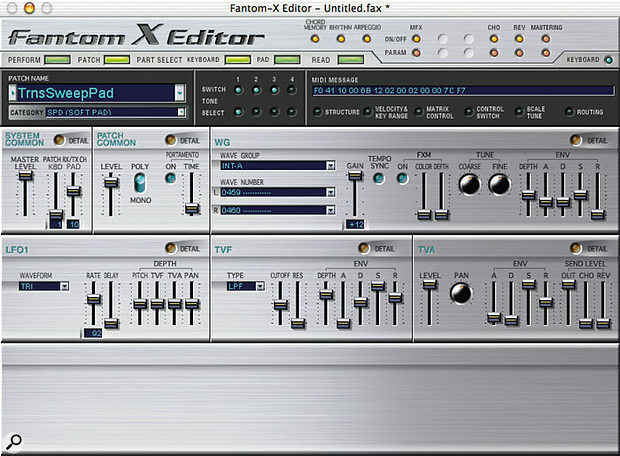 Now, if I were reviewing any other Fantom with an 'X' in its name, this is where I would say, "Ah yes, but..." and go on to discuss the FANX UP1 Fantom X Audio Track Expansion Kit, which was released while I was writing this review. Not only does this add eight stereo audio tracks to the Fantom's sequencer, it includes a sample editor, a multisample editor, and a utility that claims to convert S700-series sample libraries for use on the Fantom X. This appears to be dreamland except that... it doesn't run on the Xa! Roland have taken the rather tasty Fantom X6, and removed all the bits that gave it an edge in a highly competitive marketplace. Gone is the very playable keyboard, to be replaced by something that lacks aftertouch and does not permit the highest standards of keyboard playing. Gone are the touch-sensitive pads, to be replaced by mere switches. Gone is the large, colour LCD that make editing so simple and such fun, to be replaced by a monochrome screen. And gone is the huge ROM that made the other Fantom Xs special, to be replaced with the sound engine of the previous generation of Fantoms. Roland have taken the rather tasty but over-specified Fantom X6 and stripped out several expensive and largely unnecessary facilities to create a lower-cost workstation while sacrificing none of its essential features. Gone is an expensive keyboard unnecessary for producing and triggering dance grooves, to be replaced by something that does the job just as well at a fraction of the price. Gone are the unnecessary touch-sensitive pads, to be replaced by cheaper ones that still trigger all your favourite rhythms and samples. Gone is the large and expensive colour LCD, to be replaced by something that still allows you to tweak your sounds. And gone is the overblown ROM full of unnecessary concert piano sounds, to be replaced by an otherwise equally powerful but cheaper sound engine more in tune with current trends. On that basis, who could fail to recommend the Fantom Xa? I would say, though, that since the Xa seems in many ways to be a groovebox at heart, and is aimed squarely at dance music production, it might have been better to strip it out still further; in its current form it may still be too complex (and expensive) for its prospective market. Clearly, the Fantom Xa is not going to appeal to all potential customers, but in many ways it is still a well-crafted instrument that offers astonishing power for a price that (as always) would have been unthinkable a few years ago. Much has already been written in Sound On Sound about the Fantom series, so I suggest you take a look back at Nick Magnus's review of the Fantom S and S88 (in Sound On Sound October 2003: see www.soundonsound.com/sos/oct03/articles/rolandfantoms.htm), and Paul Nagle's review of the 'X' series (in Sound On Sound September 2004: see www.soundonsound.com/sos/sep04/articles/rolandfantomx.htm) and the original FA76 (SOS February 2002: see www.soundonsound.com/sos/feb02/articles/fantom0202.asp). In many ways, the Xa is identical to these, so if I appear to have skipped over something in these pages, the chances are that it's already been covered in Nick's and Paul's previous articles. The cheapest Fantom keyboard to date. Still an extremely powerful synth. Built-in sampler, expandable to 516MB of RAM. Many additional facilities, such as arpeggiators, chord generators, rhythm patterns, and more. Included Editor makes it a pleasure to program. Lower-quality keyboard than any other Fantom. Much smaller display than on previous Fantoms. Only one SRX expansion slot. Sampler still has limitations of previous models. Like its siblings, the Fantom Xa is a well-specified combination of an expanded XV synth engine, an MRC Pro sequencer, and 'groove'-style sampling, with oodles of extras such as user-programmable arpeggiation, rhythm patterns, and an included software Editor. However, it lacks several of the niceties of previous Fantoms, the removal of which has made it both cheaper but also less usable for some players. I suspect that it will be seen as an good price/performance compromise for cash-strapped, dance-oriented musicians and producers, and that it will be a success. Roland UK +44 (0)1792 515020.